Don’t have your own paintballs or equipment? No problem! Here at Splatball we have everything you need to play a fun an exciting match of paintball, which has quickly become one of America’s favorite new pastimes. The sport is an action-filled, warlike game, where players hunt each other with paintballs. Once they capture their opponents, they shoot them with the paintballs, thus eliminating them from the game. When it comes to paintballs, we offer nothing but the best quality paintballs on the market. We have accounts with all of the paintball suppliers. We work closely with the suppliers of our paintballs to make sure we’re getting the freshest, highest quality paintballs on the market. Since paintball is a popular sport, many people think it’s expensive, however it’s the opposite. At Splatball, players can enter a session for a fee of $20. For real paintball enthusiasts, the facility offers season passes that offers unlimited admission. Splatball is one of Minnesota’s leading paintball facilities. It’s opened seven days a week and reservations can be made by calling us at 612-378-0385. For anyone wanting to learn how to play paintball, consider walk-on play, which is typically less challenging and better suited for beginners. 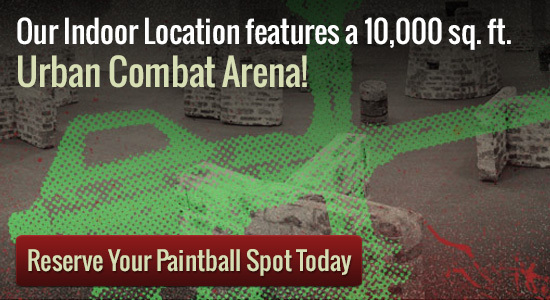 Now, if you want to play paintball, but don’t have the equipment don’t worry because Splatball has you covered. We offer rentals for guns, paintballs, air tanks, masks, and other protective gear. For a small price players can also stock up on rental equipment packages that will help them with their game. Whether you’re a newbie or an experienced player, Splatball is one of the premium sites for all paintball players. Both private play and walk-on play are available at Splatball. If you are looking for private group play, Splatball Indoor Paintball in Minneapolis, MN can accommodate nearly any sized group. Private party reservations and walk-on sessions are avaliable daily. You can reserve your spot by giving us a call at 612-378-0385.